How often do you eat out? Is it too often than you care to admit? No worries, you’re not alone. I am guilty, too. But could you say no to this pretty & and yummy boxed lunch? With all the new restaurants opening up in town, new interesting menus dished out by the chefs and cooks, it’s little wonder that the habit of eating out has become as common as wearing shoes outside one’s house. But let’s pause for a bit and evaluate this habit and think of all the money spent, food wasted and the risk of food poisoning that we expose ourselves to when eating out. 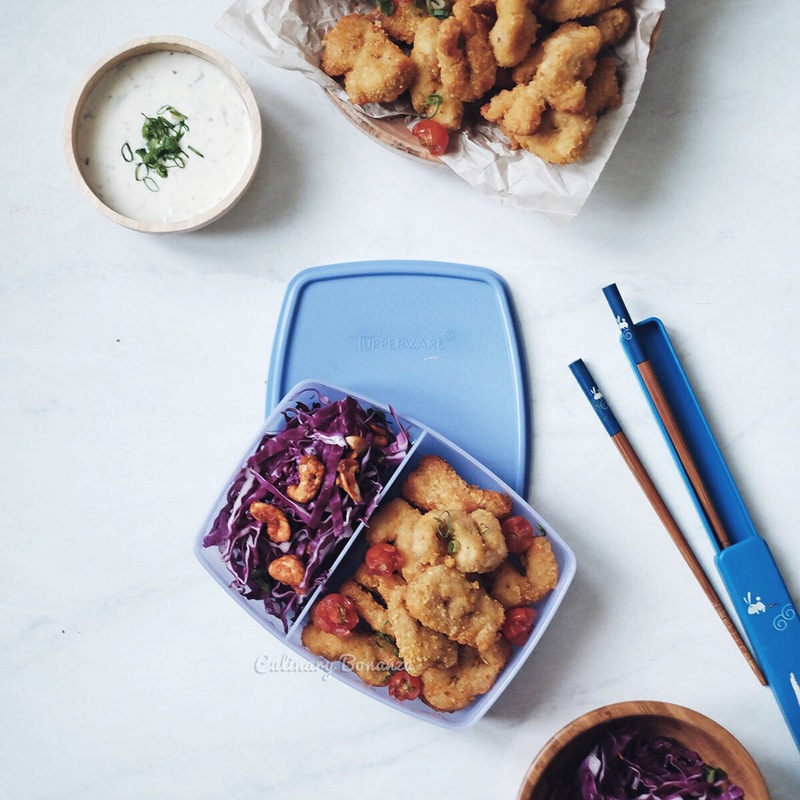 Easy bento idea: nuggets and fresh slaw - it's yummy too! As a food blogger, eating out is inevitable, it’s part of our professional hazard, but ideally, I’d like to encourage all of us to exercise a habit that not only will save our hard-earned money, reduce food waste, save the environment and help us to eat better. Yup, you guessed it; I’m encouraging a habit to bring our own lunch box to school/work or anywhere possible. I’d like to share a little bit about my childhood. Back then as a student, my Mum would make me bring lunch box to school every single day, because my parents didn’t give me regular allowances. I begrudged this because I thought it was embarrassing. As a kid, I wanted to be like the cool kids who could try all the food sold in the canteen and the food peddled outside the school gate. However looking back now, I am deeply grateful for Mum’s unrelenting efforts and the value she taught me. Bringing lunch box to school not only saved our family a lot of money for my education, but also reduced the food waste and carbon footprint that I’ve accumulated since I was born. It’s an abstract concept, I know, but for those who care enough about this Earth we are living in, this is very important. The Earth is not getting any younger and our very existence is increasing the burden that Earth has to bear to sustain our lives. - Saves money. If you ever studied and lived away from your parents, you know that this is very true. 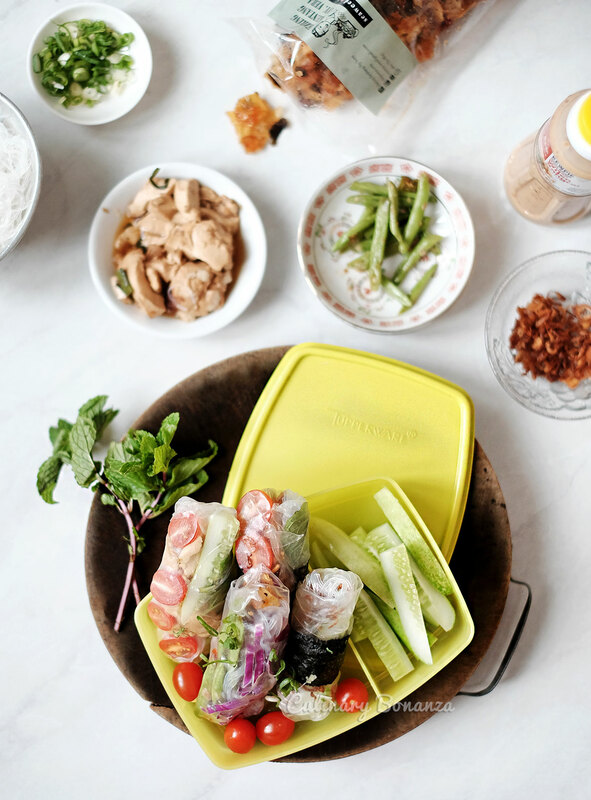 Cooking at home and bringing lunch box is one of the most effective ways to cut one’s monthly spending. - Better for health (food prepped at home is clearly cleaner and more nutritious). - Reduces food and food packaging waste (brown bags, plastic containers, aluminium foil, cling wraps, etc). Plus, any food that’s not finished consumed could still be stored and re-heated for another meal. Means more saving right? - Reduces domestic waste in general. 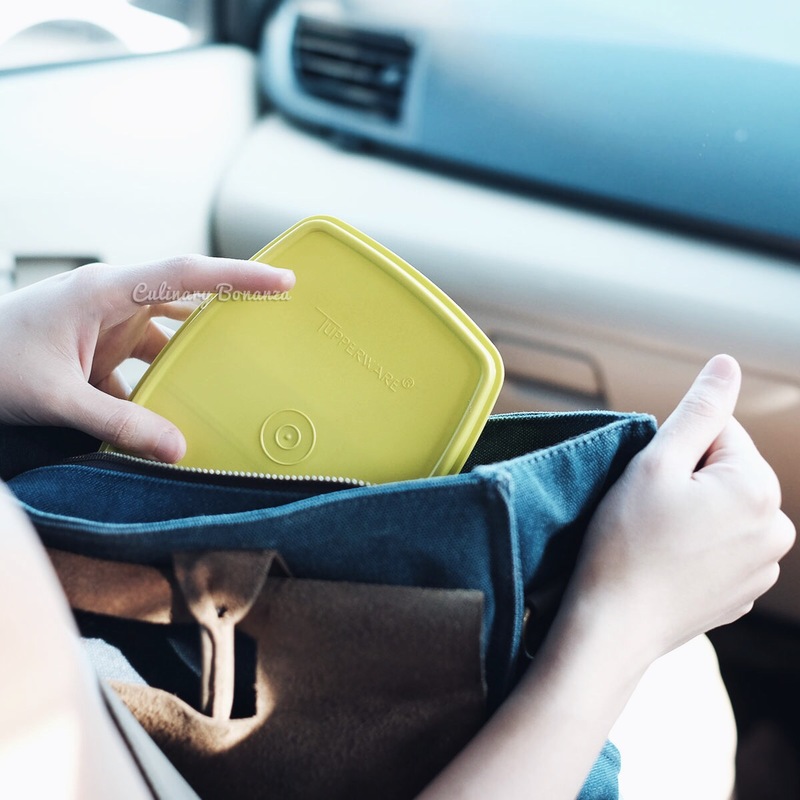 With a washable & solid lunch box in hand, the need to buy take-out / take-away / pre-packed food will be greatly reduced. - (Additional perk) It stimulates our creativity, because we'll be 'forced' to find different types of food to pack out. Perhaps nuggets & slaw on Monday, rice rolls with peanut sauce on Tuesday and so forth? 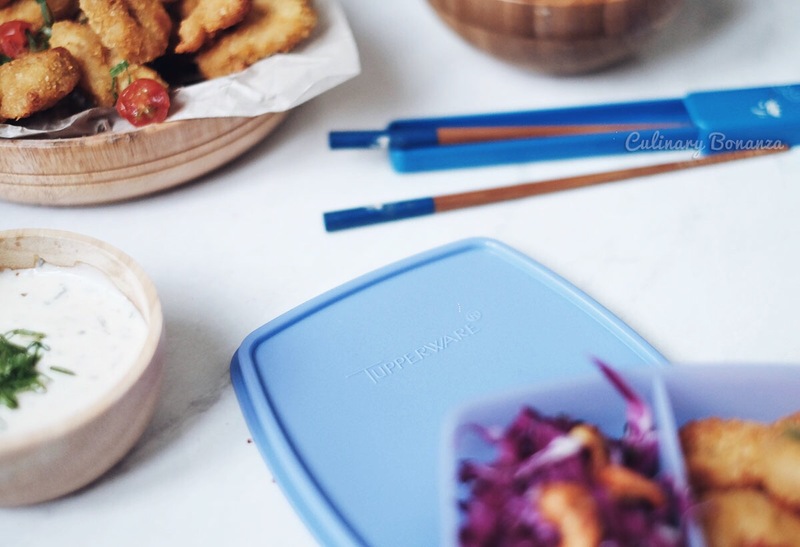 The brand 'Tupperware" in Indonesia has become so familiar, people already begin to use the name to refer to lunch box in general! Many people would assume that food bloggers eat out too often to be counted. That assumption is not wrong, but it is not entirely true either, depending on who you’re talking to. After being a food blogger for years, I’m beginning to be more selective about the places that I visit and another strategy is to bring lunch box whenever possible or when I don’t have any plans to eat out. Because, you never know when you can’t find anything on the road, especially when commuting in Jakarta’s almost permanent traffic jams. Pack some healthy snacks like granola bars, fresh fruits or something light for the road. 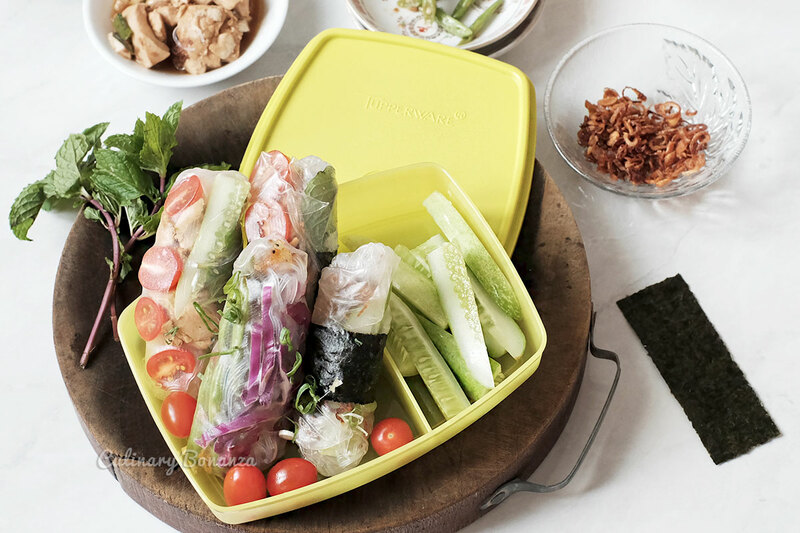 This post is created to support Tupperware Indonesia’s #BekalItuBaik Challenge. It is a campaign to encourage us to start and maintain a good habit of bringing lunch box for 21 consecutive days. The challenge is currently still ongoing and there’s still plenty time to take part, collect points and to win attractive prizes from Tupperware Indonesia. Start expressing your creativity, start a good habit and share this good news with your friends and family! 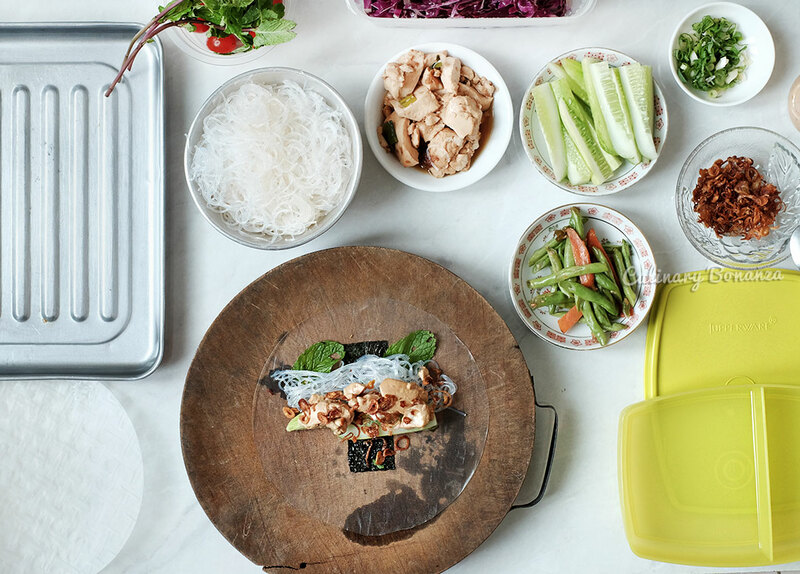 You'll also need a wooden chopping board, wet the top side & dab lightly (too wet a surface makes the rice paper slimy; too dry, will risk the paper sticking / tearing). - Place the wet paper on the damp chopping board & start assembling the fillings as desired. The rolls will be transparent so, it's best to assemble the nicely shaped / colourful ones directly on the rice paper (as these will be the ones to show clearly from outside). 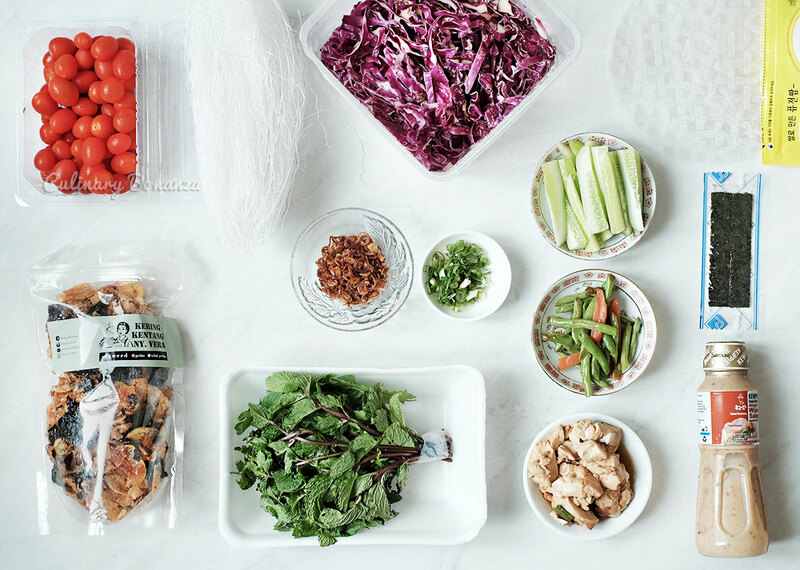 Assemble the fillings, get creative, the only limit is your taste buds and imagination! I mean I'm not a vegan (yet), but the thought of converting has crossed my mind too often. It gets tricky because reviewing places is the main thing I do for blogging and more often than not, these places serve meat or animal-based products (like cheese, eggs, honey - these 3 are the main reasons why I still can't commit yet). But anyways, it doesn't stop my fascination for delicious vegan recipes and dishes ideas. 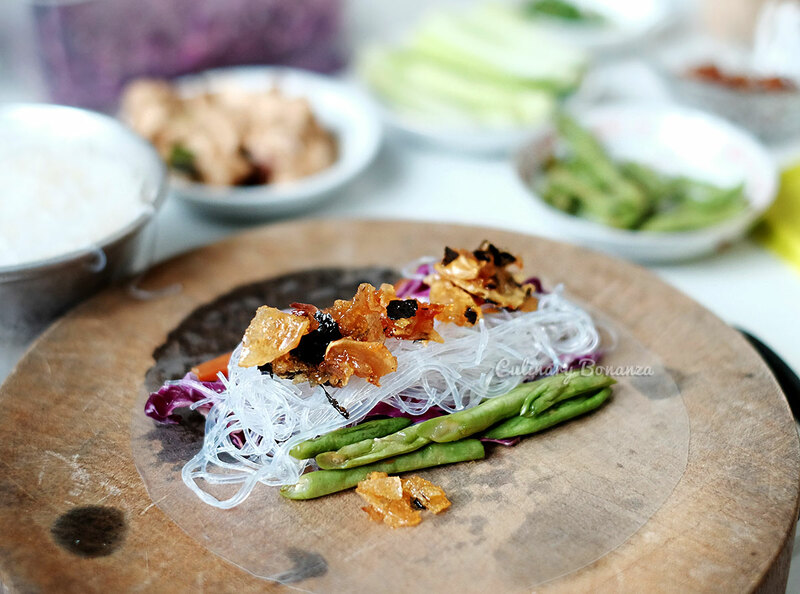 Like this spring roll, it's super healthy, fresh and packs a flavourful punch. I could even eat it without the sesame dressing sauce! Hi! Just wondering where to get the rice paper?